The other day O and I had an unexpected snow day. Hubby worked in the morning and my already short day at work got cancelled all together. 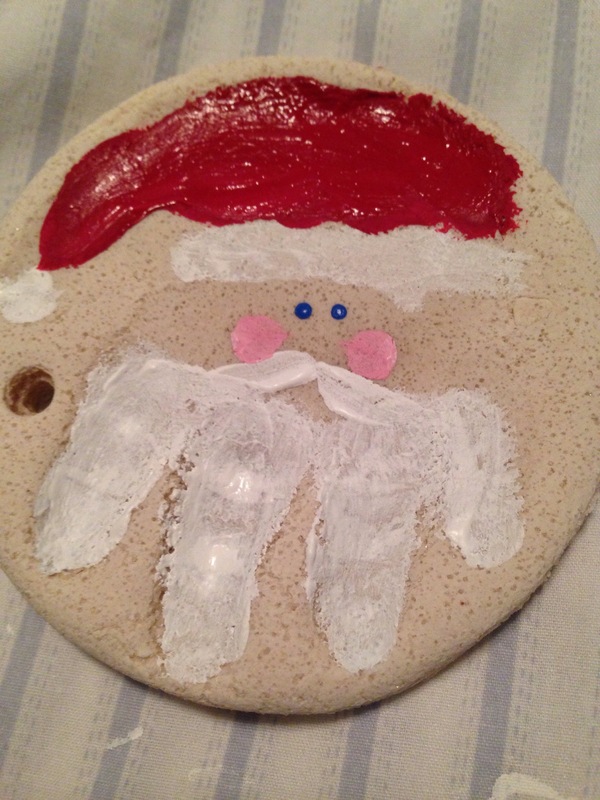 I took the opportunity to do a little toddler holiday craft with her. And you guys, I turned to Pinterest. Surprise! 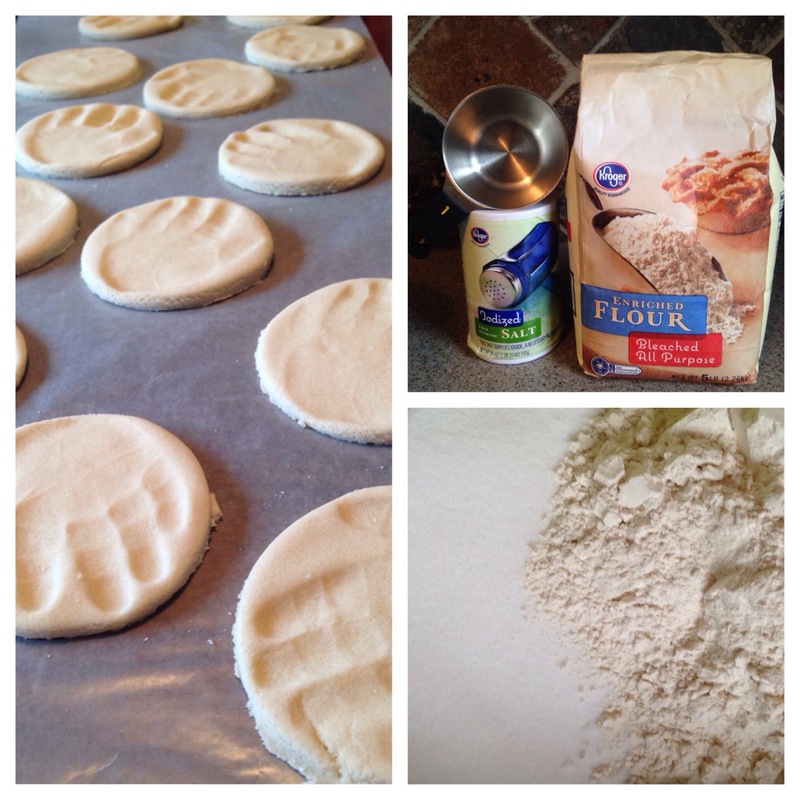 Having done salt dough before with kids, I basically knew what I wanted to do but I needed the recipe. Optional: powdered tempura paint or food coloring to add color. Mix all in one bowl. I started string with a spoon and quickly realized my Kitchen Aid dough hook would have been perfect for the job. After it was well blended I just dove in with my hands. The more you knead it the smoother it gets. Bake at 200F for 20-45 minutes depending on thickness or dry overnight. 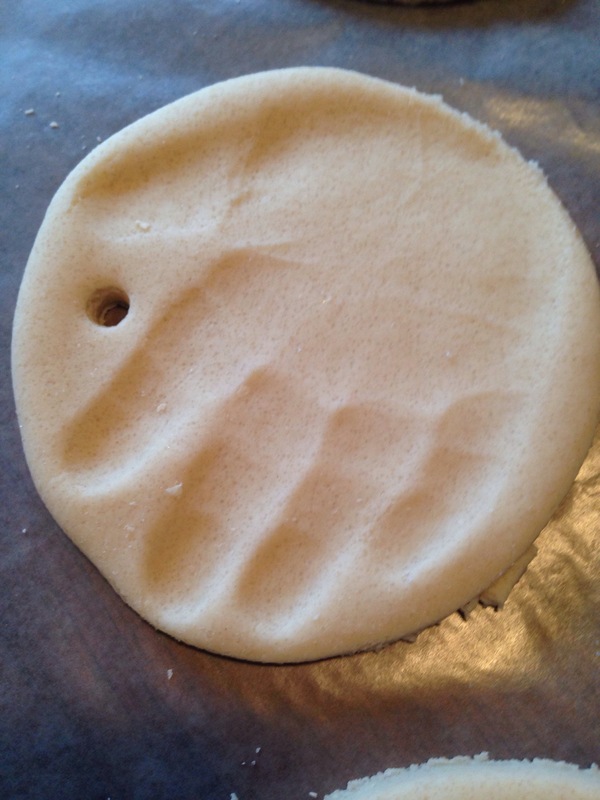 I rolled it out on wax paper, used a cup as a cookie cutter to make circles the right size for O’s hands. Then I helped her make her hand print on each cut out. This is where there were tears. Apparently the kid thought these were cookies and she was really excited about cookies… but then I had to burst her bubble. She just wouldn’t accept that they weren’t cookies. So Mom of the Year over here let her take a bite and she was really disappointed that these were not cookies. After she made about 15 prints, I made holes for a hanger and we left them to dry. I let them dry overnight (as my Pinterest sources repeatedly recommended) but I found them to still be soft, damp and still a little malleable. So I popped them in the oven as many of the sources also recommended. Um, no. NO. No. no. 20 minutes? Nope. 45 minutes? Nope. Try MOST OF THE DAY. I just kept peeking in on them. 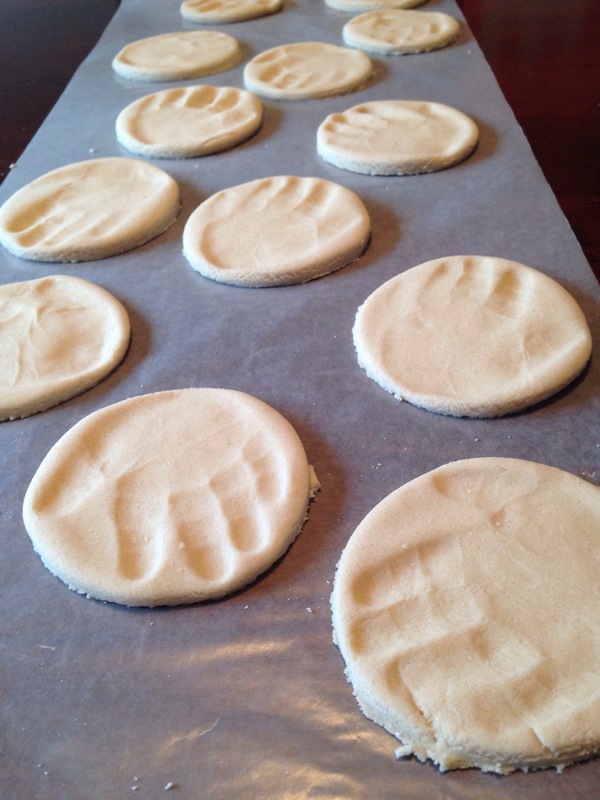 Not only did they not dry quickly… I realized they weren’t drying evenly. The bottom side that faced the pan was still wet halfway through the day! So I flipped them. And I continued to keep an eye on them. I lost track of exactly how long they were in there but they did eventually dry. 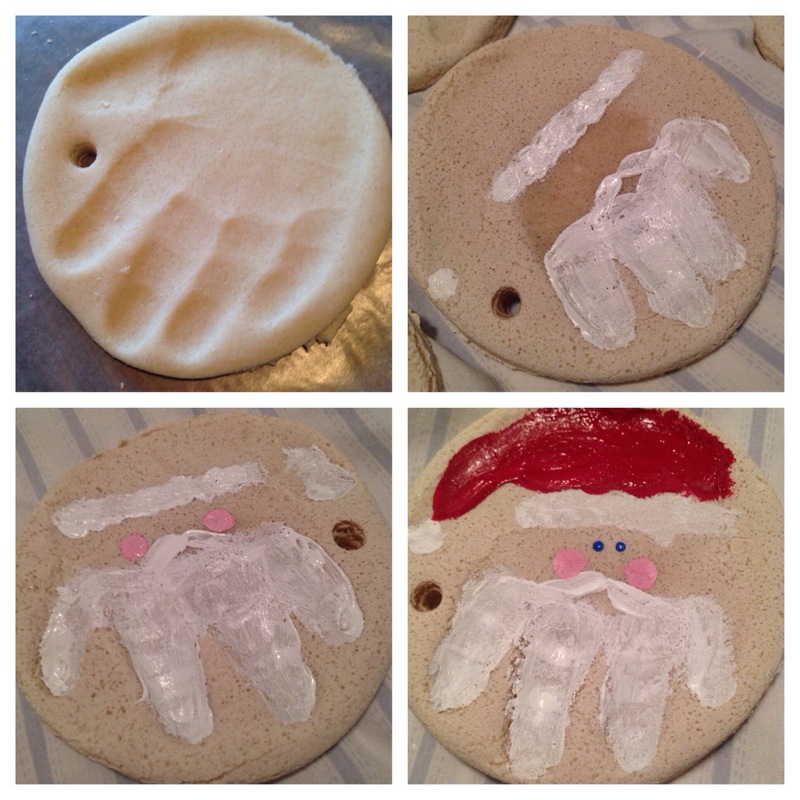 I had originally thought I’d spray paint them silver (a color I knew I had on hand) but I stumbled upon another idea on Pinterest to paint the hand print to look like Santa. I used acrylic craft paint that I already had. I’ve broken Santa down into steps above. To be honest, I did these in stages… between laundry, dishes and a tv show’s commercials. An hour maybe total. My only flaw was that I had already punched the holes. Santa will be hanging sideways… but that is ok with me. I was having fun and really considered adding glasses to Santa as a little tribute to O but decided it might be too challenging and time consuming. I sharpied her name and the year on the back. These will be given to great grandparents, grandparents, aunts/uncles and special people over the next few days. If you’re one of these people… pretend you never saw this! Of course, ours already hangs on our tree!